The Bucks, who finished an NBA-best 60-22 this season, won in such decisive fashion Saturday. The Milwaukee Bucks’ first game in decades as a consensus favorite to reach the NBA Finals could not have gone much better Saturday night. Unfortunately for the Detroit Pistons, that meant their attempt to win a playoff game for the first time in 11 years could not have gone much worse. 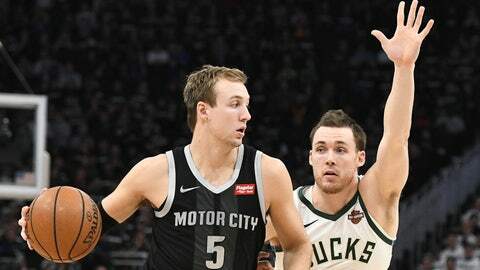 The top-seeded Bucks will look to take a commanding series lead in the Eastern Conference quarterfinals Wednesday night (7:30 pregame, 8 tip-off on FOX Sports Detroit and the FOX Sports app) when they host the eighth-seeded Pistons in Game 2. Milwaukee began its pursuit of the franchise’s first title since 1971 by cruising past Detroit, 121-86, in Game 1. It was the ninth-most lopsided NBA playoff game of the century and the biggest rout since the Cleveland Cavaliers beat the Boston Celtics, 130-86, in Game 2 of the Eastern Conference finals on May 19, 2017. “We said we’ve got to keep our composure, we’ve got to do our job and our job is to win games,” Antetokounmpo said. The Pistons have lost their last 11 playoff games dating back to May 26, 2008, when they beat the Celtics 94-75 to even the Eastern Conference finals at two games apiece. Boston won the next two games to advance to the Finals, and Detroit was swept in the first round in 2009 and 2016. Every other NBA team has won at least one playoff game in the interim except the Sacramento Kings who haven’t reached the postseason since 2006. An already-tall task for the Pistons will grow larger if star forward Blake Griffin remains unavailable Wednesday night. Griffin, who is battling a sore left knee, missed the series opener after being sidelined for five of Detroit’s final eight regular season games.